One of the core questions that we need to answer to ensure a strong tarpon conservation plan is: Is the Atlantic tarpon population made up of one large population or many smaller sub-populations? The satellite tagging data have shown that some adult tarpon migrate long distances, indicating that regional management is warranted. But at what scale? Are tarpon in Mexico the same tarpon that swim in Florida waters? Do tarpon mix between the Caribbean and Gulf of Mexico? Where are juvenile tarpon spawned – do they come from local spawning locations or do they travel as larvae from far-away spawning sites? To what extent do fishing pressure and harvest in one location impact the fishery in other locations? To what extent does the tarpon fishery in the Florida Keys depend on a sub-population, share tarpon with a larger regional population, or a mixture of these scenarios? Given recent advances in genetic science, the best way to address this important topic is through genetic analysis. In collaboration with the Florida Fish and Wildlife Conservation Commission, Bonefish & Tarpon Trust began a two-year Tarpon Genetics Program in 2014. 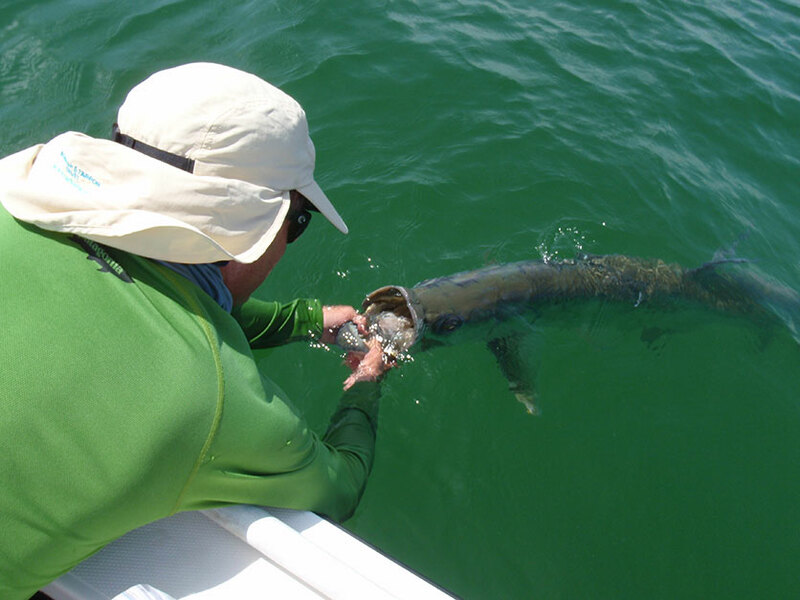 The goal of this program is to analyze the genetic population structure of tarpon to determine if there is a single, regional tarpon population or multiple sub-populations. This will determine to what extent the overall tarpon conservation strategy should focus on a single, regional-scale approach, or on multiple, local-scale, conservation measures. The Tarpon Genetics Program has concluded, providing illuminating results that will help build effective regional management and conservation plans for tarpon. This two-year collaborative study between BTT and the Florida Fish and Wildlife Conservation Commission (FWC) sought to study how many distinct Atlantic Tarpon (Megalops atlanticus) populations exist, and if more than one existed, where they were geographically located. Thanks to the efforts of anglers, guides, lodges, and researchers, more than 23,000 tarpon scale samples were collected from all over the world, providing the study with a massive dataset for analysis. Many were collected from Florida waters during the previous FWC Tarpon Genetic Recapture Study, and scales were collected from tarpon in 24 other areas across the Gulf of Mexico, Caribbean Sea, and Atlantic Ocean. Different portions of tarpon DNA were examined to determine if the patterns in each individual tarpon were the same or different from other tarpon. If they were the same, then no matter where the fish were caught, they would be considered part of the same genetic population. How many distinct tarpon populations exist? Only one! A rigorous and comprehensive suite of statistical approaches was used to analyze the data. The overall level of genetic diversity in the Atlantic tarpon indicated high levels of gene flow (mixing over generations through interbreeding) across the entire region. Fish from Virginia to Louisiana and all across the Caribbean to Brazil displayed shared genetic profiles. Even tarpon samples collected from across the Atlantic Ocean, along the West African coast, shared these profiles. The results reveal that a single Atlantic tarpon stock exists. Although a preliminary study by McMillen-Jackson in 2005 suggested two stocks (West and East Atlantic), our study used a much more extensive dataset and advanced analytical methods to reveal trans-Atlantic connectivity and one region-wide tarpon stock. This map displays the genetic profiles from one microsatellite locus, Mat-22. Each pie chart is a tarpon collection area, and each color wedge is a unique microsatellite allele (repeat unit). Alleles were shared among all sites across the Atlantic Ocean, Gulf of Mexico, and Caribbean Sea. How can gene flow occur over such great distances? Two life history traits of tarpon likely maintain the high levels of population connectivity we observed across the region. First, adult tarpon are capable of long-distance migrations (tagged fish have been documented traveling more than 1700km). During this study, several long-distance recaptures were identified. Three fish first caught and sampled by anglers in Florida waters were recaptured by different anglers along the Alabama and Louisiana coasts more than three years later. These migrations increase genetic mixing, as fish from several areas likely converge on the same spawning sites. Second, tarpon larvae can be transported great distances by ocean currents. This dispersal of young tarpon also increases mixing, as larvae originating from different spawning sites may settle in the same inshore location. The connections don’t have to be direct, they can occur in step-wise fashion: a tarpon larvae spawned in Cuba may end up in Belize, where it grows up and spawns and its larvae are transported to Florida. This connects Cuba, Belize, and Florida tarpon populations. It’s important to note that it only takes a few percent of mixing between locations in each generation to result in a single population or stock. Warm ocean surface currents in the region flow in a clockwise path, resulting in the movement of larvae among areas. Additionally, the South Equatorial Current (SEC) flows West from Africa towards Brazil and the southern Caribbean. Despite the distance between Africa and South America, the data reveal genetic connectivity in tarpon. This may occur through larval dispersal via the SEC and rare adult migrations, though migratory pathways have not been studied in the Southern Caribbean and Eastern Atlantic. One tarpon population (or stock) exists in the Atlantic Ocean. A combination of adult migrations and larval dispersal, carried in prevailing ocean currents, maintain the high regional connectivity. What do these results mean for tarpon conservation? For the Atlantic tarpon population—which the International Union for Conservation of Nature recently classified as “vulnerable”—connectivity means conservation efforts must apply broadly across the region. Tarpon mature slowly; as a result, the Atlantic population will be slow to recover from past and ongoing declines. Effective management for increasing populations will require an international scope. Recreational and commercial harvest still occurs and remains unregulated in parts of the region—the continued harvest of tarpon in up-current areas like Louisiana, Mexico, and Cuba may negatively impact the tarpon population and fishery down-current in areas like Florida and The Bahamas if enough tarpon are harvested to cause a decline in how many juveniles are produced each year. Where regulations are lacking, conservation efforts should support the creation of harvest limits and encourage catch and release where possible. At the local level, protection of critical juvenile habitat remains an urgent need. Efforts to minimize juvenile habitat loss (particularly the loss of mangroves) and restore degraded habitat will also benefit local fisheries. Given these findings, BTT will continue the regional approach to conservation. This includes efforts to improve fishery regulations; angler education on proper catch and release practices to ensure tarpon survive after release; identification of spawning locations (so these areas can be protected); and identification, protection and restoration of juvenile tarpon habitats. Although BTT’s work on these topics has been ongoing, these new results provide BTT with more leverage as they continue to advocate for the protection and conservation of tarpon throughout their range.